As I have mentioned in this blog before, I enjoy a mystery and while it pleases me when I work out the answer before the end and I can give myself an intellectual pat on the back, it pleases me more to be ultimately puzzled. I am happy to admit that The Moonstone kept me puzzled for the most part. By the time that the thief is revealed, I had worked it out but Collins had given me all of the clues by this point so it really wasn’t a great feat. Up until that point, I had been fumbling in the dark in the same way that the characters were. I particularly liked the structure of this book and the way each character adds their own details to the story as well as their own personal view of events. Each character was memorable from Betteredge, with his Robinson Crusoe obsession, to Ezra Jennings with his hidden past; all were interesting, all were distinctive. As the story unfolds, the reader occupies a similar position to Sergeant Cuff, fooled by events as they stand, unable to see the whole picture until much later on. This is a masterful novel that keeps the reader’s interest at all times. 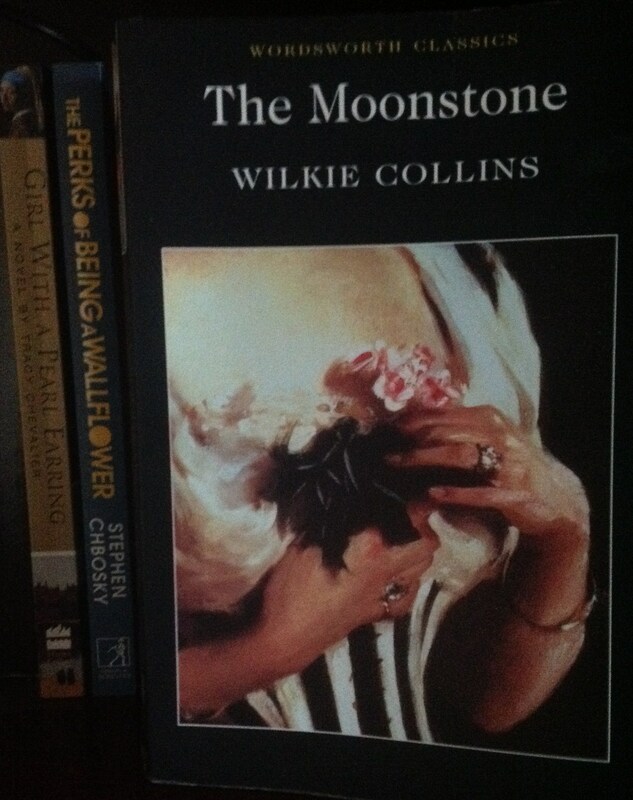 The Moonstone and the trouble it causes in respectable England seem to me to represent the punishment for colonial crimes that the theft of The Moonstone represents. That the precious stone is restored to its proper place is a satisfying ending even though the lengths the Indians go to get the diamond may be unethical. Their sacrifice for the diamond is greater than anything that the other characters go through in the course of the novel. This theme of past crimes catching up is present throughout the novel – in the form of Ezra Jennings and his mysterious past, Rosanna Spearman and may be the ultimate reason for Franklin Blake to ask for all to give their version of events – so that his past cannot catch up with him and to ensure his good name in the future. I expected this novel to be good as it had been recommended to me many times but I did not expect it to be so clever, so enjoyable and so satisfying a read. A must read for all fans of detective fiction. The Woman is White is on my to-read list. Hopefully I’ll get round to it in the not to distant future.